There are thousands of resellers on Amazon. The amount of competition can feel overwhelming and frightening, leaving many new sellers unsure if they will be able to successfully compete on Amazon. But don’t let the competition scare you off. A large number of third-party sellers proves that you can make money as an Amazon reseller. Nevertheless, it can be challenging to go up against resellers who have been in the business for years, who have high seller rankings, and who know exactly how to win the Buy Box. So what do you need to do in order to succeed as a reseller on Amazon? There are four key aspects of being a successful reseller: product, price, seller ranking, and branding. Below, we’ll go through the primary ways you can optimize these areas to become a successful Amazon reseller. 1. Sell units that have proven success but high competition. 2. Sell units with low competition but no proven success yet. If you’re a new reseller, we recommend starting with number 2. Low-competition products are a great way to establish yourself as a leader in that product category. This can help you establish a brand and make a name for yourself in the competitive Amazon marketplace. Selling a low-competition product also makes it easier for you to win the Buy Box. Winning the Buy Box is critical to improving visibility and gaining sales, which in turn improves your reviews, seller rank, and branding—all of which further helps grow your business on Amazon. The risk with this method is that there is no proven sales record yet. There could be a reason that no resellers have broken into that product. There may not be a need or audience, or the margins may be small. Make sure you do your research first. Selling low-competition products can also be challenging if you don’t have a strong seller rank on Amazon. You need a strong seller rank to optimize on Amazon search (which gains visibility and boost sales). Gaining seller rank is why some resellers choose to go the second route first (see below). High-competition products are hard to break into, but they have a proven track record of sales. Selling a popular product can help you get an influx of sales to your seller account, which quickly boosts your seller ranking and stats on Amazon. But you won’t get sales if you’re up against a lot of competition, especially competitors that already have strong seller rankings and stats. To overcome this, we recommend you offer a low price for these highly competitive products. This can help you stand out in the crowd and boost your sales. A lower price can help you win the Buy Box and attract value-driven customers who are ready to purchase. However, there are some risks to this technique as well. Selling products at a low price can start to establish your business as a “discount” brand, attracting discount shoppers. This can make it harder for you to raise your prices in the future, and you likely won’t gain the clientele that you want as you start to cultivate your business. You also want to be aware of how this will impact your margins. You don’t want to sell at too low a cost just to get a high number of sales, because this could actually cause you to lose money. This quickly adds up and can run your business into the ground. How do you know if it’s a low-competition or high-competition product? Search the ASIN (Amazon Search Identification Number) on Amazon. You can see how many sellers are on that ASIN, which will give you a general idea of your competitors. You can also look at the ASINs sales rank. An extremely high ranking shows that it’s popular with buyers (but not necessarily that there are a lot of competitors). Low or no ranking means it’s not as popular, but that could mean you’re opening up new markets. Whether you’re selling a low-competition or high-competition product, you want to ensure that you’re offering a good quality product. The products you sell define your brand. A high-quality product can position you as a high-end reseller and brand, especially as you continue to grow in the future. Additionally, high-quality products typically mean you can charge a premium once you create a strong brand behind your product. This premium can help improve your margins. Selling low-quality products will typically result in high return rates and poor reviews, which hurts your seller account in both the short and long term. You could have a product that has great quality but offers a low margin. You want to avoid low margin products as much as possible, as this can hold you back from growing your business. For example, you’re reselling a high-quality pencil case. Even though your customers may love it, you’re only making $1 for every sale. This likely isn’t worth it, especially if you need to pay for marketing and operation services like FBA. Before selecting products, do a quick cost analysis. How much would it cost to procure the item? Incorporate the costs of labeling, packaging, shipping, warehousing, and other factors. You might even want to include average marketing costs in each unit’s margin. We recommend a margin minimum of $5-10 per product. One of the biggest mistakes resellers make is that they don’t properly analyze their inventory levels. They assume that inventory levels don’t matter as much for reselling as they do for private labeling. But inventory is a foundation of the reselling business. A surplus of unsold goods can be intensely expensive—especially if you are forced to liquidate for a lower cost than purchasing price. On the other hand, too few goods in inventory can leave you without products to sell to your customers. This can cause you to constantly spend time looking for new products and orders, which takes up time and resources. 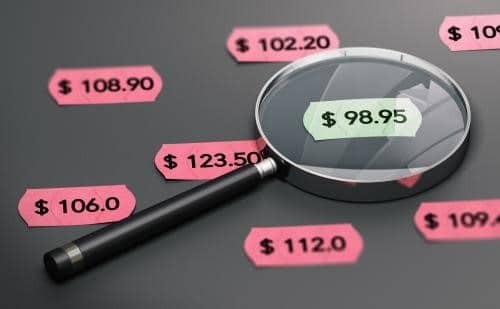 Before you invest in reselling a specific product, you’ll want to forecast your sales and inventory based on competition, pricing, quality, and market need. Fulfillment By Amazon (FBA) is one of the easiest ways to streamline your operations while improving your Amazon ranking. FBA will handle stocking, storing, picking, and sending goods, and they’ll even handle customer service and returns. This frees up time and resources to focus on sales and marketing. Plus, FBA makes products Prime-eligible. This can help you instantly win the Buy Box if your competitors aren’t using FBA since Amazon always favors Prime sellers. FBA also lets you offer free one-day and two-day shipping to Prime customers, which can be one of the greatest competitive advantages on Amazon. Amazon Prime customers are also loyal to Prime, so they’re more likely to buy from a seller that offers Prime than not. This Prime loyalty can then sleep over to your personal brand loyalty. Using FBA will slightly cut into your margins, but it is one of the most effective ways to streamline and grow your business. Another key mistake of Amazon resellers is that they resell any products that come their way. While this can help make a quick buck, it’s not the way to grow a business. If you want to grow your profits and business in the long term towards strong success, you need to build a brand. Your brand shouldn’t be based on your product. Your product can and will change, especially as a reseller. Instead, you want to focus on creating some sort of lifestyle that can help you resell products. For example, you might want to be a home cleaning brand. You can resell cleaning products and promote your brand at the same time. This can also leave the door open for private labeling if you choose to do that in the future. At Seller’s Choice, we focus on building brands from the inside-out. We ensure your brand voice is consistent between your product listings, email campaigns, website, and more. We help you create stunning images that set apart your listing while giving you the key marketing tools to help you win the Buy Box.